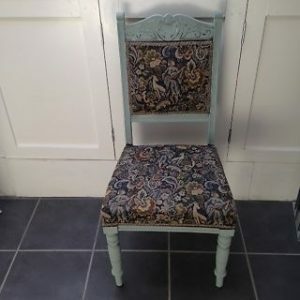 A vintage high back heavily carved vintage bedroom chair, upholstered to the seat and backrest in floral patterned fabric. 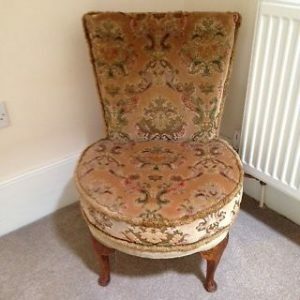 A vintage high back spool vanity dresser chair on solid wood legs, upholstered in patterned velour. 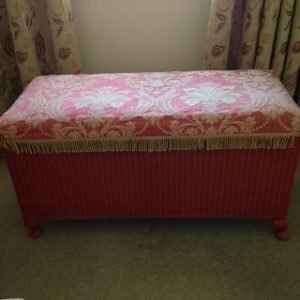 A large vintage hand painted pink Lloyd Loom blanket box, upholstered to the seat in pink and cream damask fabric. 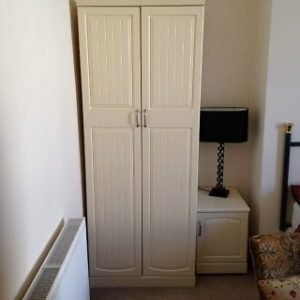 A tall standing white solid wood double wardrobe, together with a matching bedside cabinet. 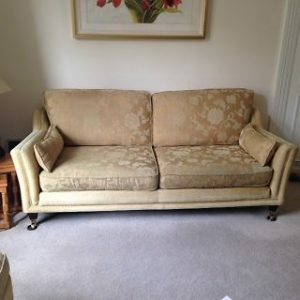 A two seater high back vintage sofa on mahogany legs and brass castors, upholstered in champagne patterned fabric. 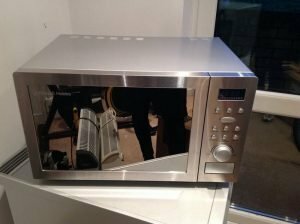 A stainless steel mirror fronted Russell Hobbs counter top microwave oven. 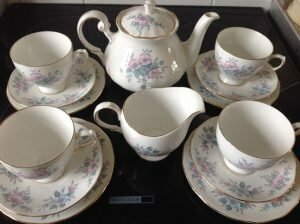 A floral patterned, gold rimmed Coclough bone China part tea service, to include a teapot, a milk jug, four teacups, four saucers and four side plates. 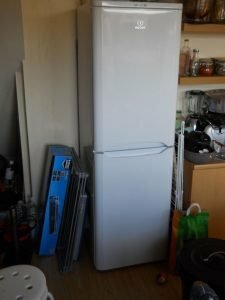 A tall standing white Indesit frost free fridge freezer. 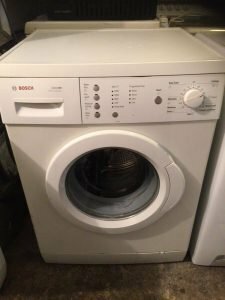 A white Bosch Classixx 1200 spin 9kg under counter washing machine. 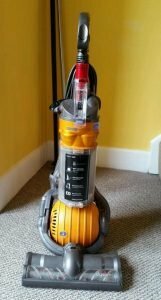 A yellow and grey upright Dyson DC 24 ball vacuum cleaner. 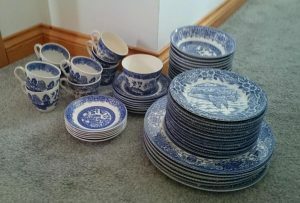 A willow patterned vintage part dinner service, to include dinner plates, side plates, bowls, saucers, teacups and a sugar bowl. 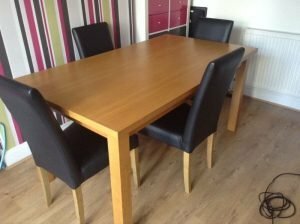 A solid wood rectangular dining table, together with four high back dining chairs, upholstered in black faux leather. 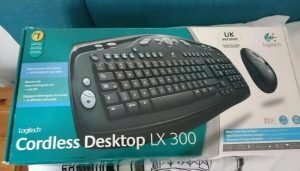 A brand new boxed black Logitech cordless desktop LX 300 keyboard. 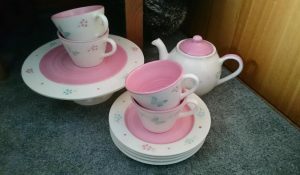 A pink and white butterfly and flower patterned part tea service, to include a teapot, a cake stand, four teacups and four saucers. 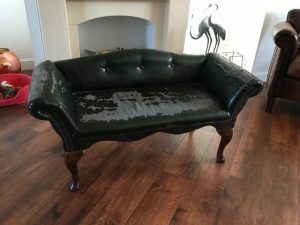 A vintage low back two seater chaise lounge sofa on mahogany legs, upholstered in black leather. 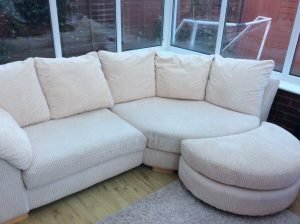 A two seater high back sofa and matching storage footstool, upholstered in cream fabric. 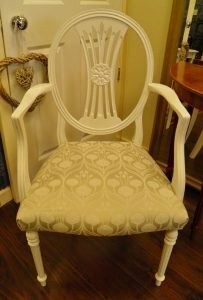 A hand painted white solid wood oval back vanity dresser chair, upholstered to the seat in patterned satin. 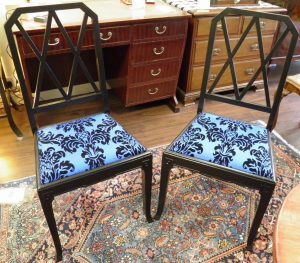 A pair of vintage square backed solid wood dining chairs, upholstered to the seat in blue and black damask patterned fabric. 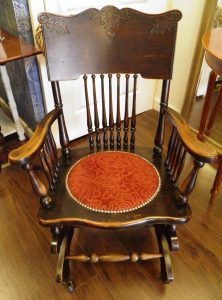 A vintage high back mahogany rocking chair on castors, decorated with carving and studded detailing. 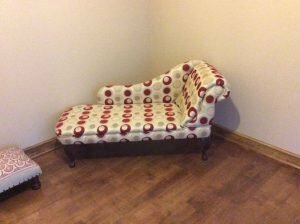 A right hand chaise lounge sofa on mahogany legs, upholstered in red, grey and cream patterned fabric.